A 67-year-old man who died after driving his motorcycle into the back of a car in Louisville has been identified as David McDowell, according to the Lexington Herald Leader. Police say when traffic in front of McDowell slowed unexpectedly, he was unable to brake in time and ran headlong into the rear of a stopped car. McDowell had been driving alongside another motorcyclist at the time, who managed to swerve into the emergency lane and avoid crashing. More than 4,500 motorcycle drivers are killed in accidents in the United States every year, according to data from the National Highway Traffic Safety Administration – and 88,000 people sustain injuries. Contact the Troutman Law Office to discuss your case. Matt Troutman is an accident attorney in Louisville who has successfully handled claims involving auto accidents, defective products, wrongful death, and other types of injury. If your case goes to trial, personal-injury lawyer Matt Troutman has the litigation experience and resources to represent your interests in court. Call 502-805-0321 to schedule a free case evaluation. You can also visit USAttorneys.com to learn more about injury lawsuits in Kentucky. Motorcycles are capable of great speeds and nimble maneuvers, which makes them both fun to ride and convenient for anyone who wants to skirt traffic. Unfortunately, these characteristics can also make them very dangerous. NHTSA data shows that 74 percent of motorcycle accidents in 2013 were frontal collisions. The reason? Motorcycles are capable of quick acceleration, and drivers can lose control of their bikes when travelling too fast. Passenger car drivers should keep an eye out for vehicles passing them from the side – but even if they do, they can easily miss a relatively small, very quick motorcycle. When riding a motorcycle, it is tempting to straddle lanes in order to bypass gridlocked traffic. This practice, however, is highly dangerous because drivers may switch lanes suddenly, without warning. The nature of a motorcycle’s body leaves its driver more exposed than he or she would be if operating a car – and without the protective body of a passenger vehicle, even a slow speed crash with a road hazard can throw a rider to the pavement. Alcohol use is not limited to drivers of motorcycles, but its effects are perhaps more serious. To navigate a speedy vehicle on two wheels, a driver must be concentrating on the task at hand. Driving while intoxicated can hinder coordination, impair decision-making, and ultimately, lead to an accident. 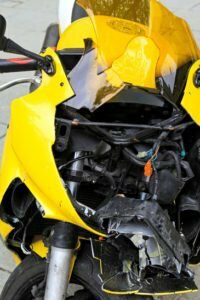 If you were injured in a motorcycle crash through no fault of your own, contact an experienced accident attorney from the Troutman Law Office. You may be entitled to compensation for medical expenses, lost income, and non-economic damages.